Take your hot dogs and dry them off on paper towels. Dust the hot dogs with flour, coating them completely. The cornmeal batter won’t stick to the hot dogs unless they are coated in flour. Shove popscicle sticks into the flour coated hot dogs. Set the hot dogs aside. While all of this is going on, it’s a good idea to get your hot fat to heating up. You want the temperature to be about 375F. Allow the fat to preheat so it is almost smoking by the time you are ready to add the corn dogs. Now, to coat the floured hot dogs with batter you swirl the hot dogs in the bowl of batter until they’re coated, and then drop them into the hot fat. Only fry a few corn dogs at a time. 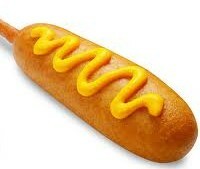 If the corn dogs crowd each other they don’t fry very well. Using tongs, turn the corn dogs when the bottom side is well browned. When browned on all sides, remove the cooked corn dogs from the fat and allow them to drain on paper towels. Repeat the process until all of the corn dogs are cooked or until you no longer have enough batter to coat the hot dogs.